This Home's Maker - William Leigh of Liverpool. Recorded, a single date, 1780. Interestingly, there is a very fine dial with similar features illustrated in "The Longcase Clock Reference Book" by John Robey ( fig. 9.8 p.478 ) by William Leigh but signed Newton ( le Willows ) which leads to speculation that it's by the same man who moved ( or had two outlets ). The moonphase tidal dial even has the same high tide indication for Liverpool. 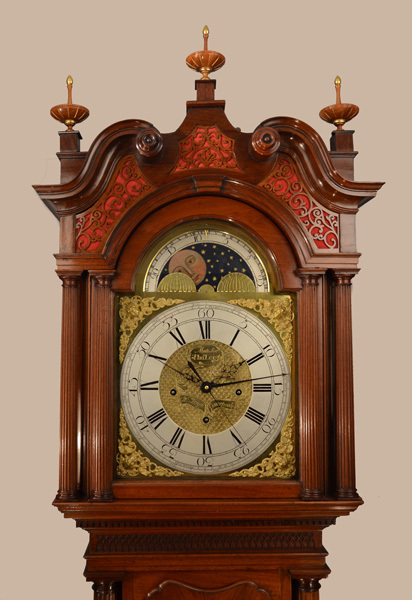 Typically "Liverpool," long door, flame mahogany case with "flying saucer" finials, over shallow box back swan neck pediment. Red "silk" backed frets under and between the swan neck sweeps. Full fluted hood pillars with 2 matching half pillars to each side of hood and 2 applied to hood door. 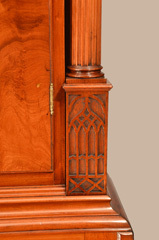 Dentils to throat moulding with Gothic tracery details under. Full fluted columns to trunk on Gothic tracery supports. Book matched veneers to shaped top trunk door repeated in the raised panel base giving a pleasing "fountain" effect to both. Typical Liverpool "brickwork" quoins to base. The whole set on shallow ogee bracket feet. 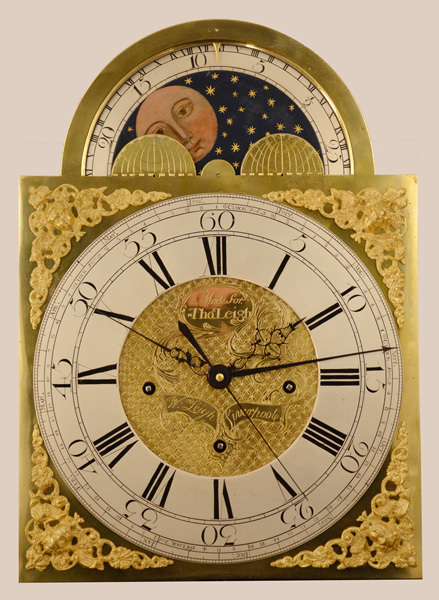 14" breakarch brass dial with TIDAL, starry sky, MOONPHASES to arch. The raised, silvered, chapter ring showing conventional hours and minutes, outside of which is the EQUATION OF TIME indicator and finally the YEAR CALENDAR. The dial centre with typical engraved cross hatched quilting and engraved - Made for Thos. ( Thomas ) Leigh, to upper dial centre and - Willm. ( William ) Leigh Liverpool to lower dial centre. Typical large cherub's head spandrels and 4 blued cut steel hands. Beautifully executed high quality, complex, 8 day, movement with "starry sky" TIDAL MOONPHASES to arch ( calibrated for "Home" port - St. George's Dock, Liverpool ), CENTRE SWEEP DEADBEAT SECONDS, CENTRE SWEEP YEAR CALENDAR, EQUATION OF TIME indicator, rare HOURLY MUSICAL feature plus hourly ( rack ) striking on a larger, single bell. N.B. Most musical clocks play at 12, 3, 6, and 9 o'clock it's unusual to play HOURLY. William Leigh of Liverpool. Recorded, a single date, 1780. Interestingly, there is a very fine dial with similar features illustrated in "The Longcase Clock Reference Book" by John Robey ( fig. 9.8 p.478 ) by William Leigh but signed Newton ( le Willows ) which leads to speculation that it's by the same man who moved ( or had two outlets ). The moonphase tidal dial even has the same high tide indication for Liverpool.